Print Audit challenge and save your business money! We can tailor the exact solution for your needs, from the small office to the large corporate. We have the ideal offering for you. PC based software that enables office workers to work faster and more efficiently with scanned documents as PDF files. The product makes it easy to capture, combine, edit and secure scanned documents through an intuitive, user-friendly interface. 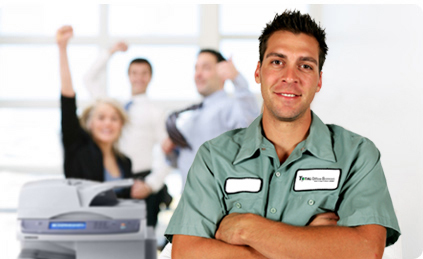 The product compliments the eCopy ShareScan Essentials or Suite product. eCopy embedded solution only that runs natively on Ricoh Java enabled multifunctional devices (MFD) that helps office workers use their Ricoh MFDs to quickly and securely scan paper documents and distribute electronic copies as PDF files, increasing workgroup productivity through improved access to information. The product offers scanning to e-mail, fax, network folders and eCopy Desktop. In addition eCopy ShareScan Essentials platform architecture opens unlimited opportunities for integration with any business application through a variety of application integration capabilities which include eCopy sourced connectors as well as an extensive range of third party developed connectors. The ShareScan suite is available in three forms, external ScanStation for Ricoh, external ScanStation for Scanners and Ricoh embedded that runs natively on Ricoh Java enabled multifunctional devices (MFD). The ShareScan Suite offers all that essentials offers and includes all the eCopy developed connectors in the base cost, this includes cost recovery, bates numbering, eCopy's range of document management connectors, SharePoint, Quick Connects and Right Fax, also the extensive range of additional third party connectors can also be added to the solution. Now you can provide enterprise-level print security and convenience while reducing print waste and costs - with Equitrac Office 4, the most-advanced version yet of our market-leading output management solution. Equitrac Office 4 and Express 4 provides simple yet powerful network-based authorization, authentication and accounting for all printer and copier use. Available as both device-embedded or terminal-based solutions, Equitrac Office 4 supports networked multifunction printers from every major office equipment manufacturer as well as multiple print workflows, database types, operating systems and user identification methods - all of which speeds and simplifies direct integration with your existing IT infrastructure. Directly print to the most efficient device on the networkControl print costs, both on colour and mono printsSimplified IT Equitrac software simplifies life for IT administrators. With centralized equipment administration and control, it improves service levels, minimizes IT resource requirements and reduces printing-related help desk calls.Proactive fault detection and timely error notification help technical staff to resolve issues before they become problems. And Equitrac's new Device Monitoring Engine provides a single console to track the status and history - including current paper and toner levels and recent failures - of all networked devices.Improved productivity and convenience - flexibility to release documents to any networked device - anywhere throughout the company - lets users avoid lines or print their jobs whenever convenient. Plus, Equitrac's Device Monitoring Engine lets administrators route jobs away from unavailable devices. Extensive reporting capabilities - make more informed equipment decisions with the insight delivered in summary, detailed and total activity reports. See at a glance who produces the most output, which devices are most heavily used or where problems typically occur. Improved color management - with Equitrac you can easily control who may print to color devices, for what purposes and how much output they may produce.A better environment - document production has wide-ranging environmental impact. By managing output, you can reduce consumption of natural resources and the volume of non-recycleable materials that end up in landfill. Directly print to the most efficient device on the networkControl print costs, both on colour and mono printsSimplified IT Equitrac software simplifies life for IT administrators. With centralized equipment administration and control, it improves service levels, minimizes IT resource requirements and reduces printing-related help desk calls.Proactive fault detection and timely error notification help technical staff to resolve issues before they become problems.